One size, about 16" by 16"
Create a visually stunning piece for your home. 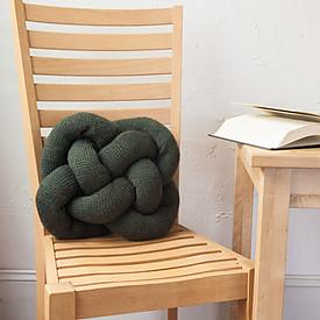 This pillow starts as a very long tube, then it’s then stuffed and cleverly woven around itself to form a knot. Instructions are included in the pattern for tying the knot. You will need a large amount of fiberfil for this pillow. I would highly encourage anyone attempting this to undo and retry the knot if your pillow doesn’t look like the photos. The knitting is the time consuming part, and you don’t want to end up unhappy with your project- please take the time to get the weaving/knot formation correct. See the video above for help, or feel free to ask me questions!